I apologize for my insults as well. This is a touchy topic and given the emotional state of the world lately it's easy to get a little worked up and turn on each other. The democrats front runner, has some serious vices. Trump, will eat him for breakfast and not to mention this guy is bought and paid for. Who really wants a puppet for potus? My preference is they voluntarily leave like many of them promised to do if Trump won in 2016. Well... we won yet they are still here. Liars, all of them. Phage If I am not mistaken there are those on the Religious right who have nefarious pasts. Oh feeling a bit backed against the wall for your side? 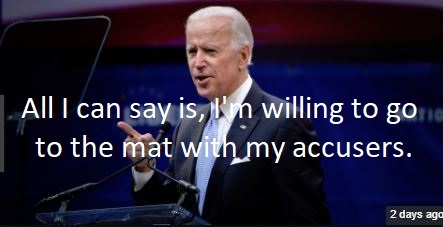 I don't think the evidence is quite as profound as the film against Biden. But oh well put out that stab for the team!!! Battery? Probably assault instead if he doesn't actually touch them. Or, Sexual Assault depending on the jurisdiction. Sexual Battery would be a non-starter just about everywhere. If this happened, as it has been reported, in 2014, then the question is why did this woman wait until now? It is a valid question, and one that should be answered. After all during that time frame there was Cosby that was being indicted and on trial, and the entire Anita Hill that was a glaring reminder. So during that time frame at any other time and point why did this person not come forward, why wait until now to come forward and speak. With all of the people that have come forward and state this, surely now it was prudent to come forward and stay something. There is one other option that is present and that comes to mind.